Continuing with my address to some particular accusations made against the Gospel texts, we're going to take a look at some work of New Testament scholar and historian of 1st Century Israel, N. T. Wright. Wright taught New Testament studies for 20 years McGill, Cambridge, and Oxford Universities before serving as Canon Theologian at Westminster Abbey, Dean of Lichfield Cathedral, and now, finally, Bishop of Durham in the Church of England. He's also a prolific writer, with perhaps his most important works being the 8-part Christian Origins and the Question of God series in progress now, including The New Testament and the People of God, Jesus and the Victory of God, and The Resurrection of the Son of God. In chapter 2 of his book The Challenge of Jesus: Rediscovering Who Jesus Was and Is, Wright is exlporing some Messianic ideas held in 1st Century Israel, with some attention to the effect the Messiah would have on the world beyond the nation of Israel herself. When Israel's God finally does for Israel that which he has promised, then, in much Jewish thought, the effects will ripple out to reach the whole world. The coming King, in many Old Testament texts (e.g. Is 42), would bring God's justice not merely to Israel but to the whole world. Many, said Jesus, will come from east and west and site down with the patriarchs in the kingdom of God. Jesus does not appear to have said much else on this subject. This statement of Jesus's is one of the few found on the topic in the Gospel texts. As Wright continues we see why this is of interest. We also see in Acts 15 that such problems persisted, later concerning what of the Hebrew cultic tradition was expected to be assumed by converted Gentiles. Such dissensions were ignited by Pharisaic elements within the church(15:5), possibly on account of the nationalistic convictions of the Pharisees, which would have obviously been ill-disposed to accepting the Gentiles. 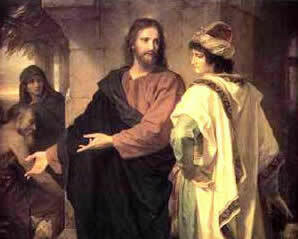 If such issues existed, as the New Testament certainly affirms, then authors who, in hopes of giving power to the apostolic fathers, inserted statements into the mouth of Jesus of Nazareth concerning divinity and other "new sayings to suit their own setting" would presumably have further butressed the apostles' authority regarding what theological contentions they were wrestling with at the time. This line of reasoning may sound at first like a logical fallacy, perhaps argumentum ad ignorantiam; because it has not been proven that Jesus said these things, He must not have said them. This however is not the conclusion being drawn, or the point of Wright's arguement. Whether Jesus spoke more on the subject is here irrelevent, the point is that it was not included in the Gospel narrative. If we have an author who is trying to give authority to the early church fathers concerning divisive issues that the church was actually facing, this and other such omissions from the sacred text certainly indicate, if nothing else, an author incompetent for such a task. By the way, if you'd like to see a truly awesome photo of the Lord Bishop, you need only look here. I wanted to point out that my friend Dan Dumas has just created a new blog, Revelant Ways. Also, he has a post concerning the upcoming Invisible Children event DISPLACE ME. For more on it, check out the link or just head over to invisiblechildren.com/displaceme. So I decided to do a short series of posts regarding certain accusations pretty frequently made against the New Testament texts, partially as a response to an atheist presentation I just read on 18 Unconvincing Arguements for God, and partially in reflection on some reading that I've been doing. One big arguement made against the credibility of the New Testament, more specifically of the Gospels, regards the integrity of the authors, i.e., what agendas they are driven by. 2) to, mainly by means of the above, solidify the authority of the leaders in the early Christian church. The first response to these accusations will come from my man, C. S. Lewis. Lewis was not a New Testament scholar or a historian, but rather was a literary scholar, well known for his work in Renaissance and Medieval literature. His studies also included mythology, language, and philosophy. As an author, he is best known for his works The Chronicles of Narnia, The Screwtape Letters, Mere Christianity, and That Hideous Strength. Assuredly I say to you, this generation will by no means pass away till all these things take place. The one exhibition of error and the one confession of ignorance grow side by side. That they stood thus in the mouth of Jesus Himself, and were not merely placed thus by the reporter, we surely need not doubt. Thus the accusation, aforementioned, of attributing divinity to Christ is roundaboutly approached. An instance of both error and "the one confession of ignorance" by Jesus does little to support claims to divinity. Unless the reporter were perfectly honest he would never have recorded the confession of ignorance at all; he could have had no motive for doing so except a desire to tell the whole truth. And unless later copyists were equally honest, they would never have preserved the (apparently) mistaken prediction about 'this generation' after the passage of time had shown the (apparent) mistake. This passage (Mark 13:30-32) and the cry 'Why hast thou forsaken me?' (Mark 15:34) together make the strongest proof that the New Testament is historically reliable. The evangelists have the first great characteristic of honest witnesses: they mention facts which are, at first sight, damaging to their main contention. Much of Lewis's work in apologetics, such as in Mere Christianity, relies on philosophy and logic; here his chief cornerstone is common sense. Any unscrupulous editor who would augment Christ's sayings or even add statements to the gospels to push an agenda of making a God of a man simply wouldn't display such errancy in this God. This does not support the agenda. Would there be any conceivable reason within such an agenda to include this account? We don't expect our gods to make mistakes, and we do expect them to know what they're talking about. This would have beeen no different in 1st Century Palestine. Such a report--within Mark's gosepl, the model of the other two synoptics, no less--hardly betrays an agenda to force Jesus into Godhood. With part two we're going to take a look at an actual New Testament scholar and historian of 1st Century Israel, as well as Bishop of Durham in the Anglican church, N. T. Wright. I make no secret of my being a fan of Søren Kierkegaard. I'd like to think that he and I would have gotten along well, just as I maintain that Jack Lewis and I would have been good chums, and probably G. K. Chesterton as well. I've not yet read as much of K.'s stuff as I'd like, but I like all that I've read. If anyone thinks he is a Christian and yet is indifferent towards his being a Christian, then he really is not one at all. What would we think of a man who affirmed that he was in love and also that is was a matter of indifference to him? K. can be rather blunt at times. This, blunt as it is, is a hugely important statement. To overlook it would be a sign of that indifference that K. is condemning here as paganism. So I stop to consider this statement. The scriptures support Kierkegaard's analogy to the person in love, noteably in the early chapters of Hosea(describing Israel's relation to God) and in the book of Revelation, where the church is freqently described as the Bride of Christ. For each of us the Baptist's words are true: "He must increase and I must decrease." He will be infinitely merciful to our repeated failures; I know no promise that He will accept a deliberate compromise. For He has, in the last resort, nothing to give us but Himself; and He can give that only insofar as our self-affirming will retires and makes room for Him in our souls. Let us make up our minds to it; there will be nothing "of our own" left over to live on, no "ordinary" life. Scripture describes marriage as the two individuals becoming "one flesh." Lewis sees our marriage to Christ as apart of the Bride as more involved, making room for Him in our souls. This, this call to decrease while the LORD in us increases, is not something done easily, much less indifferently. Yet this is commitment of the wedding of the church to Christ. Each of us as members of this body must be continually giving up ourselves to make room for the Spirit of God in us. This is what it means to follow Christ, to take up the cross as Christ did after relinquishing His will to that of His Father, this is what it means to be a Christian, and the giving up of your whole identity for the substitute of some new creation cannot be done indifferently; that's simply a contradiction. The church today must recognize this. There's no "ordinary" life, separate from the life in Christ for the new creation; life cannot be compartmentalized to make it so. That is, scripturally, not what God is talking about when describing His Bride. Our calling, to love the Lord, to love people, to go and sin no more, to go tell, with all of the layers, is a constant, better to be lived not at all than only on Sundays(Rev. 3). The only course of action that the LORD leaves open to His followers is that of decreasing, that is, becoming the new creation that the Spirit in us will create when we let Him increase and live through us. Several religious leaders have responded to yesterday's brutal mass-killing at Virginia Tech through Newsweek's 'On Faith' section. 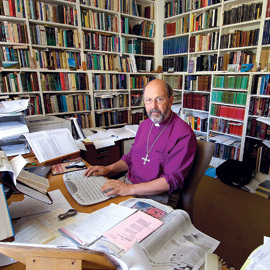 Seeing Bishop N. T. Wright's name among these comes as little surprise given his last book (released in Nov.), Evil and the Justice of God, likely touches very close to home with the sort of senseless violence that shocked the world yesterday, and that is executed daily around the world in many warring areas, such as Uganda. 17 So He said to him, "Why do you call Me good? No one is good but One, tat is, God. But if you want to enter into life, keep the commandments." 19 'Honor your father and your mother,' and, 'You shall love your neighbor as yourself.' "
We've all heard this story. I think we usually associate a simple "you cannot serve God and mammon" or "where your treasure is, there your heart will be also" message to it, both of which, among others, are appropriate. The reason I've been considering this of late is on account of a simple realization that I just had about this tale: Jesus ended up sending this guy away. The young ruler apparently didn't have what it takes to inheirit enternal life. In the church today, however, we'd accept him with open arms, appreciate his tithing, and eventually, with an outstanding record like he had, make him a deacon. Why is that not sitting well with me? Christ was indeed testing where this man's heart was at and in such a way as we never see Him do again. Yet even one such test is unheard of in the church today. It seems we are not so worried about the state of the heart, the real state of the heart, as our Lord was. I know that the most modern manufacture has been really occupied in trying to produce an abnormally large needle. I know that the most recent biologists have been chiefly anxious to discover a very small camel. As telling as this statement is, much more is the acknowledgement of this shift within the culture of the church today. With top-selling books like Your Best Life Now and the flood of this outrageous name-it-claim-it theology that treats God like an ATM machine and assures you of His desire for you to drive a Mercedes... these examples are perhaps over-used, but they are nonetheless accurate. Thoreau's writings evidence his disgust of the advertising industry, then only in its earliest years in latter half of the 19th Century. Today, of course, advertising has grown beyond anything he could have imagined. The starting paragraphs of Stanley Baran's Introduction to Mass Communication read to this effect: today you will find a college student sitting in a Starbucks with his Apple MacBook in front of him wearing an American Eagle polo, Hollister pants, and Crocs, while Starbucks plays a CD throughout the shop that can be purchased at the register. You get the idea. Billions of dollars are poured into advertising yearly for the sole purpose of seeing consumers pour billions of dollars back into the product. Yet this whole economic system that we've carefully established exists as a sharp contrast to the economics of the early church seen in the Book of Acts where all who believed... sold their possessions and goods and divided them among all, as anyone had need (Acts 2:44-45). The Apostles apply the Gospel broadly. There must be a different kind of economics. There must be a different kind of inclusion around the table and in relationships. There must be prayer, breaking bread, teaching doctrine, but there is more. You cannot leave out the issues of hunger, inclusion, assistance, mercy ministries, economics or even political theology. While you can point out the kinds of issues that weren’t addressed, it’s remarkable what kind of issues are addressed…and how they are addressed. “Christian culture” is always a counter-culture, not a consumer culture, an entertainment culture or a political lobby. “The Church” is a gathering of people loyal to Jesus who believe certain things, but it is a movement of people who apply the gospel to those issues in their midst that demonstrate the meaning of the Kingdom of God. Our finances should be 'demonstrating the meaning of the Kingdom of God.' This is the opportunity which Christ placed before the rich young ruler. The opportunity which horrified the young man and sent him from Christ's presence. How broadly are we asking the church to apply the gospel? Is it okay to not let our faith effect the way we vote(as some politicians have boasted)? Can I safely ignore the food and water shortages of poor countries because I live in America? or leave the AIDS epidemic in the 'capable hands of the the experts' to be solved? Should I really sell all that I have, and give it to the poor? Would Christ really ask that again? It sounds unreasonable to our ears, but is God concerned with the culture of Capitolism or the culture of the His Kingdom, where the possessions and goods are sold and divided among all, as any one has need? We may be tempted to look at all of this as just a 'little nugget', or 'something to chew on', but since this issue, when honestly approached, divided the one man from Christ, I'm afraid we cannot avoid searching our own hearts, for while we keep all these commandments, including, we would say, "love your neighbor as yourself", Jesus may mean and demand more than we could ever guess. My brother and I were talking about this at dinner the other night when he brought up a point I'd never considered: Protestantism, from it's very creation, has been reductionalist. The Reformation, with it's proclamations of 'sola scriptura' and such, was seeking to remove the fluff from the church, to return to the core of things of the faith. We see this still today in the emphasis on the personal relationship with Christ: just do this, say this prayer, and don't worry about the other stuff until later. Our idea of relating to God becomes very... minimalist. Yet if we are to claim the image put forth by St. Paul, that the church is the bride of Christ, we begin to see the problems with such a minimalist approach. A marriage doesn't work when the members are seeking to do as little as possible to simply get by, and so long as we have this mind-set the hard questions will remain unasked, and, more frighteningly, unanswered. 1Now after the Sabbath, as the first day of the week began to dawn, Mary Magdalene and the other Mary came to see the tomb. 2And behold, there was a great earthquake; for an angel of the Lord descended from heaven, and came and rolled back the stone from the door, and sat on it. 3His countenance was like lightning, and his clothing as white as snow. 4And the guards shook with fear of him, and became like dead men. 5But the angel answered and said to the women, "Do not be afraid, for I know that you seek Jesus who was crucified. 6"He is not here; for He is risen, as He said. Come, see the place where the Lord lay. 7"And go quickly and tell His disciples that He is risen from the dead, and indeed He is going before you into Galilee; there you will see Him. Behold, I have told you." 9And as they went to tell His disciples, behold, Jesus met them, saying, "Rejoice!" So they came and held Him by the feet and worshipped Him. 10The Jesus said to them, "Do not be afraid. God and tell My brethren to go to Galilee, and there they will see Me." Our Lord is risen! Happy Easter!